“An 1812 Hurrah for Old Shepherdstown” from “Shepherdstown in the Olden Time,” The Register, February 12, 1850. In…the War of 1812 with Great Britain, Shepherdstown sent nearly three complete companies to the field. Captain Samuel Lane recruited nearly a full company and Lieut. Wager a good part of another. Capt. Henry Van Swearingen raised a company of Riflemen. At the Battle of Plattsburg it was the Shepherdstown men that especially repulsed the British attack. They were commanded by Lieut. Bennett Riley, now the Governor of California. At the capture of Fort George, on the Niagara River in Upper Canada, Michael Durnhoeffer, a Shepherdstown man, leapt upon the wall of the Fort amidst a shower of balls, and taking off his hat, cried out at the top of voice “Hurrah for old Shepherdstown.” But besides the above companies, the town and vicinity furnished enlistments under Captains Post, Strother, Henshaw, Swearingen and Cowan. When news arrived that the British were coming up the Patuxent, Mr. Jas. S. Lane who heard of it in Williamsport, hurried back to Shepherdstown, and though arriving late in the evening, raised a company before midnight. They behaved well at Baltimore. In 1812 the United States and Great Britain went to war about maritime issues—neutral shipping rights and freedom of the seas. Some U.S. citizens also suspected that the British had stirred up Indian attacks on the frontier. Others, called “War Hawks,” welcomed the opportunity to secure more western land and maybe land in Canada and the Floridas. In the disputes leading to the war, many Shepherdstown leaders protested the policies of the Democratic-Republican presidents Thomas Jefferson and James Madison that tended to restrict trade. The Federalist Party grew in the area and as early as 1809, 200 to 300 town citizens turned out for a protest meeting presided over by Col. Joseph Swearingen with Captain Henry Shepherd as secretary. According to an account in the Shepherdstown Register of February 12, 1850, when the war came, citizens of the town jumped right into the middle of the fight. Written some 35 years after the events, the article mentions names and claims glory for Shepherdstown soldiers, but the details are difficult to verify. At the Battle of Plattsburg “it was the Shepherdstown men, ably commanded by Lieut. Bennett Riley, that especially repulsed the British attack,” says the Register. By the time the article was written, Riley was the governor of California. 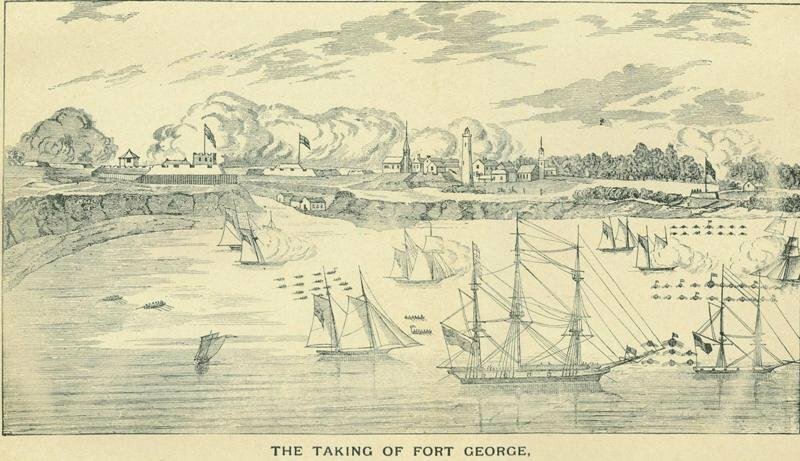 At the capture of Fort George, on the Niagara River in Upper Canada, a Shepherdstown man, Michael Durnhoeffer, is said to have leapt upon the wall of the fort amidst a shower of balls, and taking off his hat, cried at the top of his lungs, “HURRAH FOR OLD SHEPHERDSTOWN.” Nearly three complete companies from Shepherdstown raised by Capt. Samuel Lane, a Lieut. Wager, and Capt. Henry Van Swearingen were involved in this northern fighting. Moreover the town and vicinity also helped fill the ranks of companies raised under Captains Post, Strother, Henshaw and Cowen. An important Shepherdstown participant in the war (surprisingly not mentioned in the Register story) was Rezin Davis Shepherd, then working and living in New Orleans, who volunteered in an elite troop of horse and also joined the staff of Commodore Daniel Todd Patterson, who planned the defense of New Orleans. Most notably, Judah Touro, a wealthy merchant and landowner in New Orleans credited Shepherd with saving his life during the Battle of New Orleans. In his will Touro left a large bequest to Shepherd, helping to make Shepherd’s fortune, which he shared with both New Orleans and Shepherdstown. The Town Hall he built for the town just before the Civil War served briefly as the Jefferson County seat and then as the first structure of what became Shepherd University. Another way Shepherdstown contributed to the war effort was through the making of flintlock long rifles. A May 2013 article in the The American Rifleman noted that the only documented surviving example of a flintlock long-barreled rifle used in the Battle of New Orleans was made by Shepherdstown’s John Jacob Sheetz (1785-1860) and used in the battle by a former Virginian, John Ross. No doubt Sheetz rifles were carried by other riflemen in the war. Rezin Shepherd’s story is well-known, but much of the account of Shepherdstown’s soldiers in the War of 1812 is difficult to uncover. Records seem to be incomplete, perhaps because many soldiers volunteered for brief terms and enrolled in militia companies that left no records, and no accounting of casualties seems to exist, particularly for men in the ranks. More can be learned of officers, and recent research has uncovered some interesting details of Henry Van Swearingen, a war hero now long forgotten who, like Shepherd, was also a member of one of the town’s founding families. Henry Thomas Van Swearingen (1785-1820) was the son of Benoni Swearingen and Sarah Bedinger Swearingen. On May 21, 1812, he received appointment as a second lieutenant in the First Rifle Regiment and proceeded to organize a recruiting rendezvous in Shepherdstown. By August he reported success and requested an order for rifles from the Harpers Ferry Armory, telling Adj. General Thomas Cushing in Washington that “there is no greater inducement for men to enlist than the sight of a rifle.” By the end of February 1813, he had recruited 50 riflemen and led them north toward the border with Canada. Though some troops, like the New York militia, refused to cross the border, the Shepherdstown men marched into Canada. On May 27, 1813, by now a first lieutenant, Swearingen was severely wounded in the fighting at Fort George, Canada, and taken prisoner. Sent to the British port of Halifax, Nova Scotia, he was interned in a prison ship. Thirteen months later he returned to Shepherdstown as a paroled prisoner of war, now with the rank of captain, and resumed his direction of the Shepherdstown recruiting rendezvous. In the spring of 1815, he resigned, saying that “business of a private nature in the Western Country, together with the present delicate nature of my health has obliged me to be under the mortifying necessity of tendering my resignation.” He was discharged from service on June 15, 1815. At some point, probably after his discharge, Swearingen accepted another assignment. Again, the cloud of obscurity falls across the story, because he disappears from the military record after his resignation, but newspaper accounts in Kentucky say that he traveled to the British West Indies with the rank of colonel to negotiate the exchange of prisoners of war, a task which, one account says, “’as in all other with which he was engaged, he discharged with credit.” His experience as a prisoner at Halifax perhaps commended him for this assignment, but, if as seems likely, his health remained delicate, it was probably ill-advised. In 1819, Swearingen married Sarah A. Breeden (or Brieden) in Jefferson County. Shortly thereafter he traveled to Glascow, Kentucky, to attend to an estate inherited from his father. He fell ill of a “bilious fever” and died on January 13, 1820, at the age of 35. It is likely that his war wounds and West Indies service contributed to his early death. Just before he died he filed a will leaving all his possessions to his wife. His widow remained in Shepherdstown and married Henry Berry in 1822. The War of 1812 ended with the Treaty of Ghent, signed on Christmas Eve, 1814. The Battle of New Orleans, on January 8, 1815, a route of the British by American forces commanded by General Andrew Jackson, took place after the peace treaty had been signed, because the slowness of transatlantic communications meant that the news of the treaty did not arrive until long after the battle took place. After all the fighting, the Treaty of Ghent changed little. The two sides agreed to end the war, exchange prisoners, and restore boundaries as they had been before the war. Some of the issues became moot, and others the United States and Great Britain resolved diplomatically over time. It is likely that the period of import restrictions stimulated Shepherdstown’s crafts production.